MOSCOW, October 31. /TASS/. The damage to Russia’s Admiral Kuznetsov aircraft carrier, when a floating dock where the vessel had been undergoing modernization accidentally sank, is considered as insignificant, Head of the United Shipbuilding Corporation Alexei Rakhmanov said on Wednesday. "There is no financial assessment, we look at the damage - there is nothing terrible there, and I think we will deal with it ourselves. As soon as we make the assessment, I will inform you. This won’t be a big sum," Rakhmanov said. There is nothing "scary" about this damage, he noted. 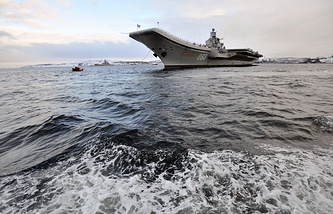 The PD-50 floating dock sank overnight to October 30 in Murmansk, northwest Russia, during the planned exit of the heavy aircraft-carrying cruiser Admiral Kuznetsov, the Russian Navy’s only aircraft carrier. According to preliminary information, the warship itself had its take-off deck damaged by the fallen crane and is now at the 35th Ship Repair Plant. Four people were injured, two of them are in hospitals and another one is missing. The Admiral Kuznetsov’s next dock inspection needs to be carried out in June 2019, he said. The key issue is now whether the PD-50 floating dock will be taken to the surface and restored. "I can’t say that we are in a deadlock situation, we always have Plan B and some other options," Rakhmanov said. According to him, the sunken dock is "the most efficient" out of all current options. The PD-50 is one of the largest floating docks in the world and the biggest floating dock in Russia. It was built in Sweden in 1980 under the order of the Soviet Navy. It is 330 meters long, 67 meters wide and can carry up to 80,000 tonnes. Its area is 22.1 square km, which is a slightly less than Moscow’s Red Square.